mama elephant | design blog: September Anniversary Stamp Previews - Day 1! September Anniversary Stamp Previews - Day 1! First us is Me and My Yeti which you've been seeing peeks of for a couple of weeks now. We are just so darn excited about this fluffy ole Yeti and all his tiny friends that truly make him the marquee of the holidays! 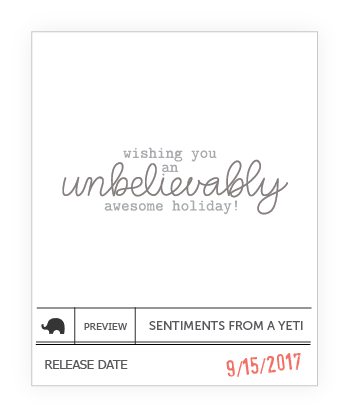 There was just so much to this yeti set that it had to go in a companion set named Sentiments From a Yeti, you'll love the yeti-approved sentiments and fun, coordinating banners included as well! I'm so stoked about this next set called A Beary Christmas. This set has the most heartwarming scenes that will make anyone go "awww!" We absolutely love this family of holiday bears celebrating the magic of the season! So many iconic images synonymous with the holidays, snowflakes definitely tops the list for sure! Finally, we have created this beautiful, timeless snowflake set that is perfect for backgrounds, stamping on gift wraps, or they can take the center stage on its own! Holly's Snowflakes is truly one of those classic holiday sets that you need to have in your collection! We've got this beautiful hand-lettered set named Season's Wishes penned by Paola Esteron in our line-up! You have all loved her previous sets so much, we're sure you'll love this one too! With such a classy greeting and beautiful companion sentiments, this is a must have for that little extra special message for the inside of the cards you've worked so hard on! That's it for day 1!, join us tomorrow as we sneak the rest of the stamps previews. So, any early must-haves on your list? Sound off below, would love to hear your thoughts! I can't wait! I'm excited to see the whole collection! OMG! All the cuteness! I need these! Looking awesome. I just love the Yeti, as that stamp set is just so different and looks like it is going to be a fun one! Oooh! Can you hear me exclaiming with delight! These all look amazing, can't wait to see it all! Wow!!! Looks like it's going to be a fantastic new release!!! Beautiful and absolutely darling! Congratulations on 5 years! Can't wait to see the rest of the amazing things lined up for this week! So excited for the yeti sets! Omgoodness,such cute images.I love each and every one of them. That yeti and friend is so adorable! Aww so cute! Can't wait to see more of the sentiment sets! I'm already going Awww! that bear is too cute! and loving the font of season's wishes. Still say everything is cute!! And yes I want it all!! Lol!! I love ❤️ Mama Elephant!! Can't wait 😊!! Aww... the yeti and bears are too cute. Love the handlettered greeting too. Love that bear!! Yay for yeti sentiments!! love love love the Yeti and the bear and the sentiments! YETIS and SENTIMENTS!!?!??!? I am ALL OVER THAT!!!!!! I absolutely love the yeti and the bear is adorable! 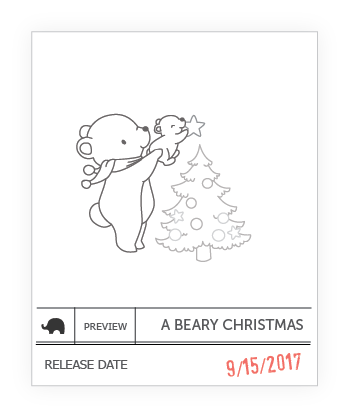 I love the baby bear putting the star on the tree. So sweet! Yeti, set, go! Must have this set and the beary cute bear set too! I just love Beary Christmas, so so cute!! Oh my goodness! So excited to see everything in full! I WANT THEM ALL! Sh don't tell me husband!